The 2013 Jeep Wrangler Moab Edition is named after the famous offroading area in Utah and while the features of the Moab Edition make this model a nearly unstoppable machine when it leaves paved roads – with plenty of luxurious features inside that make this a very comfortable daily driver on the asphalt. The Jeep Wrangler has undergone a variety of name changes that prevent it from being considered as one of the oldest vehicles in the American auto industry but the 2013 Wrangler Moab Edition is an offroad ready monster that has been some 7 decades in the making. While the Wrangler Unlimited adds a bunch of cargo space and an extra set of doors compared to the 2-door Jeep CJs from the early era of the open air SUV, this is still very much a vehicle that would make the original military Jeep’s very proud. My 2013 Wrangler Unlimited Moab Edition included a collection of optional items such as the 3-piece body colored hard top, the Tru-Lok rear differential, Automatic climate control, remote start, the 40 gig UConnect premium infotainment package and a 5-speed automatic transmission for a sticker price of $43,195 (including $995 destination). For reference, the 2013 Wrangler Unlimited Moab Edition with only the automatic transmission (no other options) carries an MSRP of $38,715 while the base model Wrangler Unlimited Sport with the automatic transmission will run you right around $27,915…so the Moab Edition comes with a fairly hefty upcharge but it is worth every cent. The Moab Edition package for the 2013 Jeep Wrangler Unlimited has the greatest impact on the exterior design of the popular SUV and these package specific changes really give the Wrangler an awesomely rugged look from front to back. Across the front end, the 2013 Jeep Wrangler Unlimited Moab Edition begins with a unique front bumper that moves the fog lights out under the headlights (they are set in further on other models). The outer corners of the front bumper curl up to the big wheel flares to give the front end a more aggressive look while also offering more approach clearance in ahead of the front tires. Like the wheel flares, this Moab front bumper is finished in black paint that contrasts the Rock Lobster red exterior paint (that I love – both the color and the name). This solid steel front bumper also has an area that is prepped for a winch for those regular offroaders who plan on adding a little extra security in case they should happen to get stuck…or if they are trying to pull out a stuck Hummer. The front end of the Moab Wrangler Unlimited is also made more aggressive by the “power bulge” hood that sports the Moab logo on both sides. Along the sides, the Wrangler Unlimited Moab Edition wears unique painted black 17” wheels wrapped in Goodyear Wrangler tires (what else, right?) and a set of rock rails that prevent things from kicking up and hitting the body sides of the Wrangler. I love how these rock rails look and what they do but when you get into the deep mud, these side rails become coated in mud and shorter occupants will have a hard time getting in and out of the vehicle without getting some of them mud on their legs. First world problems, right? Black side mirrors, flares and door handles contrast against the Rock Lobster red paint and while a black soft top is standard, my test vehicle was fitted with the optional 3-piece hard top. This allows you to remove the front roof panels for an open air feel over the front seats and these panels can be removed very quickly without any tools. The hard rear top covers the rear seats and the cargo area and while this rear portion is removable, it requires some tools and far more time. During my time with the Wrangler Unlimited, the weather never got warm enough to spend the time taking the top off but I did enjoy some time with the front panels removed. The panels are large and fairly cumbersome but they tuck away easily in the rear seat for those times when you want to take them with you. Had it been warmer while I had the Moab Wrangler, I would have most certainly spent the time taking the rear roof off but the removable front panels are a quick, easy to use feature that I really liked. Out back, the Wrangler Unlimited Moab Edition wears another unique bumper with a rock rail design that protects the body with protective grilles over the taillights to keep them from being smashed or ripped away by passing branches. The Moab Edition package brings an exterior design to the 2013 Jeep Wrangler Unlimited that I love. These exterior changes improve the offroad worthiness of the Wrangler Unlimited while also working to emphasis the “sport” in SUV. This is, in my opinion, the best looking factory offered Wrangler package in recent memory. The 2013 Jeep Wrangler Unlimited Moab Edition is offered with very few interior options but unlike Jeeps of the past – it is because this Wrangler only comes heavily loaded. Leather seats with heated fronts are standard in black leather and almost everything else inside of this Jeep is finished in black from the ceiling to the floor with more leather on the steering wheel, through the center console and on the door mounted armrests. Gun metal grey HVAC vent rings and Moab branded dash and door grab handles do a bit to break up the blacked out treatment but overall, the dark interior design provides a very sheik look. The front seats are deep and comfortable with plenty of leg and head room for the driver and front passenger but in terms of elbow and hip room – a larger driver and/or front passenger might feel a bit squished between the inner door panel and the center console. This is an interior that cradles you somewhat like an upright sitting sports car so in that respect, it is very much unlike the average SUVs that go to great lengths to provide plenty of space for passengers in every dimension. The rear seats are a traditional split bench design that can be folded down to yield more cargo space but when in their locked and upright position, there is plenty of seating space even for taller adults and more than enough space to comfortably seat three kids. Like prior Wrangler models, the 2013 Unlimited Moab Edition takes a minimalist approach to the interior design but unlike older models – all of the goodies that you could want are present. Front and rear power windows are controlled by a set of switches mounted just below the infotainment screen while the power exterior mirror controls are also located on the center stack. With the exception of the center stack and the button-clad steering wheel, the Wrangler Unlimited has a very clean, streamlined look. My test vehicle was equipped with one of the optional infotainment systems that integrate the stereo and navigation controls into one tidy touchscreen that controls it all but drivers who prefer to keep their hands on the wheel can make most sound system adjustments from the buttons on the steering wheel spokes. At first glance, the Jeep Wrangler Unlimited Moab Edition has a no-frills interior but between the plush heated leather seats, the automatic climate control system and the state of the art navigation/stereo system the Moab Edition doesn’t force buyers to compromise modern comforts in exchange for the ability to drive pretty much anywhere. While the Moab Edition doesn’t offer the level of comfort or passenger space as the Grand Cherokee, this modern Wrangler Unlimited is a gorgeous evolution of the old school Wranglers that had bare metal door panels and an AM radio so while this new Jeep offers the same go-anywhere capabilities as the old models – modern buyers can enjoy many of the same luxury items as those less capable SUVs. The 2013 Jeep Wrangler Unlimited Moab Edition is powered by the 3.6L Pentastar V6 and with 285 horsepower and 260lb-ft of torque, this mill packs plenty of power to give the 4-door SUV impressive acceleration attributes on road and off. When mated to the optional 5-speed automatic transmission and the standard 4WD system, the EPA expects that this Wrangler will offer 16 miles per gallon around town, 20mpg on the highway and an average figure of 18mpg. During my time with the Moab Wrangler Unlimited, I fell well short of the averaged expectation with a real world number of 16.9 miles per gallon but I did very little highway driving and I spent a ton of time in sloppy roads with lots of wheelspin that surely didn’t do the fuel economy any favors. Had I not spent so much time in 4WD (sometimes 4WD low) with the tires slinging mud everywhere I expect that I could have gotten much better fuel economy. In the short time I did spend cruising down the highway, the on board fuel economy gauge indicated that I was reaching that 20mpg figure. If driven on regular roads in good conditions, I would expect that the EPA figures would be easily achieved but even with lots of time spent in sloppy conditions - I was impressed with the fuel economy figures of the Wrangler Unlimited. The Moab Edition was named after a famous offroading destination in Utah so it would only be fitting for me to test this 2013 Jeep Wrangler Unlimited in offroad conditions. 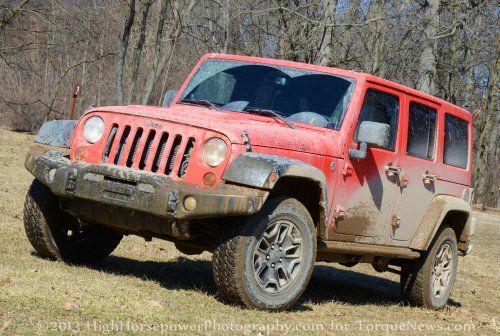 However, since serious offroading proposes more risk to the vehicle than I am willing to take and few people buy a brand new vehicle with the intention of hammering the trails – I tested the surefootedness of the Wrangler Unlimited Moab Edition on some of Michigan’s sloppiest public roads. With the unseasonably cold and wet spring, I had a chance to take to some area roads that were buried in soft mud and covered in ice. These arent offroading trails – these are public roads that regular people drive every day but these roads feature ruts and holes that would render mere mortal vehicles immobile. The bumps and potholes would shake apart the suspension and brake the aluminum wheels of many average cars while the ice covered mud would send many drivers calling for a tow truck. On the other hand, these roads proposed no problem for the 2013 Jeep Wrangler Unlimited Moab Edition. The roughest ruts and bumps felt like nothing when riding inside of the Moab Jeep. Unlike other vehicles which would get to bouncing around on the rough roads so severely and quickly that the suspension never has a chance to do its job, the suspension of the Wrangler Unlimited Moab Edition feels firm and confident no matter how rough the terrain. While the stiff suspension setup certainly doesn’t allow you to forget that the bumps are there, the Wrangler stays straight and true on these rough roads and it does so without feeling like it is being broken to pieces. When those bumps and ruts turn into deep mini lakes of mud, the Wrangler Unlimited Moab Edition has no problem getting where it is going. On roads where I have (unfortunately) had a hard time pulling 4WD trucks through certain muddy areas without the help of another vehicle and a tow rope – the Moab Wrangler effortlessly pulls itself from the soft, deep mud without any real work. Even in situations where the mud was creeping up to the middle of the black Moab wheels, at no point was I forced to rely on 4WD low (although it was used a bit to see how much of a difference it makes). When locked into 4 low, the Moab Wrangler confidently traverses even the worst road conditions so those who are forced to deal with these types of roads will never have to worry about getting stuck weather it is muddy, snowy, covered with ice or all of the above. The 2013 Jeep Wrangler Unlimited Moab Edition is easily one of the best vehicles I’ve ever driven on the local mud roads but no review would be complete without spending some time on your average paved roads. The Pentastar V6 packs a bunch of low end power that allows the Wrangler Moab Edition great acceleration around town and on the highway so merging into faster moving traffic or getting ahead of another car from a stop light is also no big challenge. The suspension is very stiff but it isn’t to the point of being unpleasant around town or on the highway although the Wrangler doesn’t offer the same level of on-road comfort that would get from other Jeep models like the Grand Cherokee. The ride quality isn’t bad but it is not as smooth as many other less capable SUVs on the road so those who don’t NEED a vehicle with this level of offroad competency likely won’t appreciate the trade off required of the Wrangler. The ride is rigid but those who don’t need a vehicle of this type may find it to be a bit too rough for their tastes. However, I loved how the Moab Wrangler rode and I suspect that anyone who will use this SUV as it is intended to be used will enjoy the drive on any road conditions. The 2013 Jeep Wrangler Unlimited Moab Edition is a vehicle that your average grandma would complain is too rough but this stiff suspension is designed with the goal of being an offroad monster and it is exactly that. No matter what kinds of road conditions or weather conditions you are facing, the Moab Wrangler will get you where you need to go year round and with the comfortable interior – it will get you there in style. The ancestor to the Jeep Wrangler was designed to face the rigors of warfare no matter how bad the conditions and the 2013 Wrangler Unlimited Moab Edition is just as unstoppable as the old school CJs but an incredible level of interior refinement has made this a much more comfortable vehicle in every way. The addition of the extra 2 doors added a ton of space for the rear passengers and for the large cargo area while features like heated leather seats and a premium infotainment system add a level of luxury once unheard of among Wrangler owners. The Moab Edition package contributes a handful of exterior features that look fantastic while making the Wrangler Unlimited even more offroad ready than the rest of the Wrangler lineup but it does so in a way that doesn’t negative impact the ability to drive this vehicle every day on your average paved roads. If you are looking for a new SUV that will comfortably seat 4 adults with lots of space left over for storage while trudging through the worst road conditions possible – the 2013 Jeep Wrangler Unlimited Moab Edition is unquestionably one of the best choices on the market today. While the capabilities of the Moab Edition will be totally lost on someone who spends all of their time driving on paved roads, someone who spends any time in the woods or even dealing with miserable unpaved roads will most certainly appreciate the Wrangler Moab Edition’s ability to tackle any road surface with confidence and comfort. For almost $44,000, I would recommend that someone who doesn’t spend much time in the mud would opt for the more comfortable Jeep Grand Cherokee but if you are a driver who does a lot of hunting, fishing or anything else that requires dealing with poor road conditions – it is hard to go wrong with a vehicle intended to drive through a warzone. The Wrangler has existed under a variety of names since the 1940s and the Wrangler Unlimited Moab Edition is a very clear example of how practice really does make perfect.